Los Angeles, May 11, 2017 – Tufenkian Fine Arts is pleased to announce an exclusive online exhibition, Sam Grigorian: Coloration, opening on May 12 on Artsy.net. The exhibition will remain open through June 15. Grigorian is based in Berlin, a city with a flourishing art scene. His work has been included in the prestigious Holland Paper Biennale in 2010 as well as Art Stage Singapore, Art Fair Koln, Melbourne Art Fair, and Palm Springs Fine Art Fair, among other major international events. His art has also been shown in numerous solo and group exhibitions, at galleries and museums throughout Europe, Australia, and California. Sam Grigorian: Coloration celebrates Grigorian’s world of colors, shapes, symbolism, and subtle nuances. In his masterful collages and mixed-media canvases alike, the artist attains a signature calibration of balance, power, and beauty. “The urge to constantly see something new and make something visible of what one would otherwise only feel, is what drives me,” Grigorian explains. In fact, he breathes new life into the materials he uses, with paper being a predominant favorite. The papers Grigorian selects for his artworks might be music notes, pages from books, or library cards — “artifacts” that have meant something to people and can engender emotional resonance because of the information they communicated. As importantly, Grigorian often uses paper that he himself has made. Often working with evocative geometric shapes that subtly reference cultural and historical moments, Grigorian tells stories of the past, in compositions that seem spontaneous, impulsive, and abstract yet are rigorously calculated and deliberate. 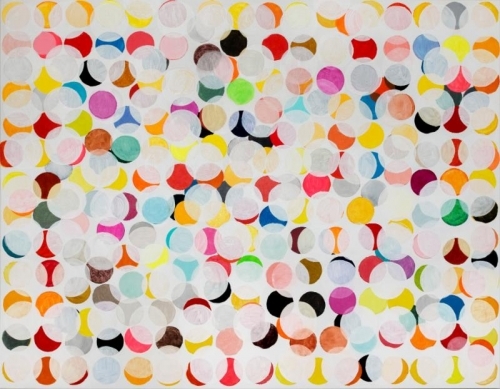 Sam Grigorian: Coloration also features the artist’s “Happiness” series, which explores the dynamic energy of brightly colored circles. With this series, Grigorian moves from his characteristic collage artwork to a loosely painterly form. The round shapes and the vibrant colors, arranged in seemingly casual compositions, capture our attention and invariably evoke a positive feeling. The experience is made all the more sublime thanks to a certain overarching lucidity which Grigorian achieves through his intricate overlapping of shapes. 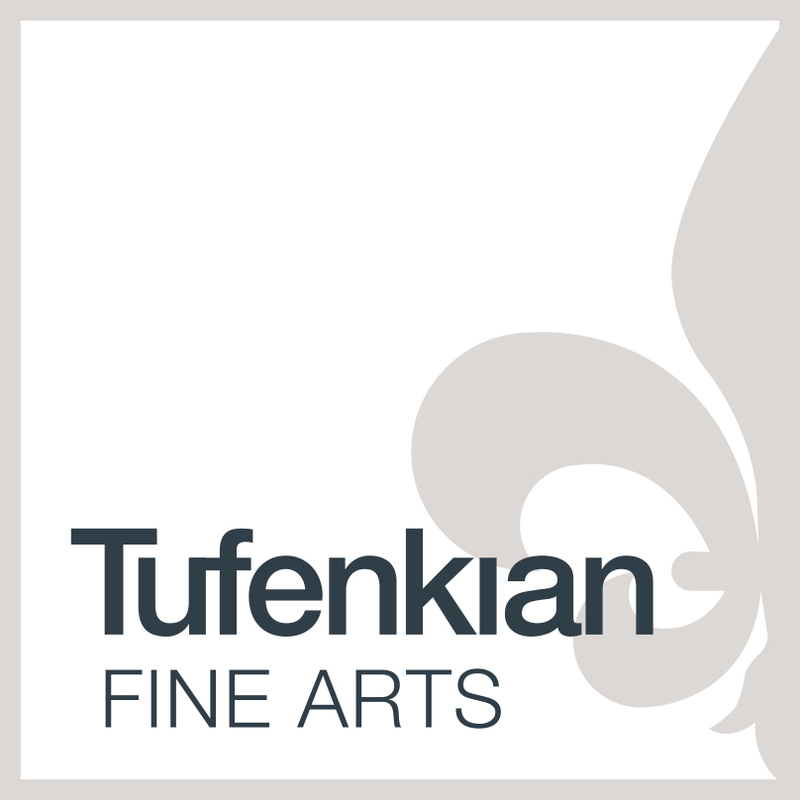 Visit us at https://www.artsy.net/show/tufenkian-fine-arts-sam-grigorian-coloration to explore and have the opportunity to purchase Sam Grigorian’s works.